The space shuttle Discovery stands ready for liftoff at Launch Pad 39A at NASA's Kennedy Space Center in Cape Canaveral, Fla. Behind the shuttle, a nearly full moon sets. Discovery is poised to launch on the STS-119 mission in March 2009. After 30 years of service, NASA's fleet of three space shuttles is standing down for good. 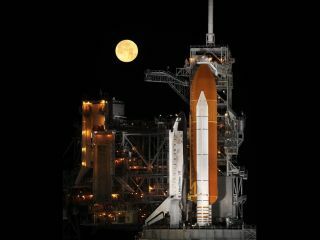 The final shuttle mission planned, the STS-135 launch of Atlantis, is scheduled for July 8. After that, the orbiters will be headed to museums to live out their lives on public display. The space shuttle Endeavour glides back to Earth on Jan. 20, 1996, after nine days in space on the STS-72 mission. The orbiter is about to touch down on Runway 15 at the Shuttle Landing Facility at NASA's Kennedy Space Center in Cape Canaveral, Fla. The combined mileage of all five orbiters is 513.7 million miles (826.7 million km), or 1.3 times the distance between Earth and Jupiter. Each orbiter, except for Challenger, traveled farther than the distance between Earth and the sun. President Barack Obama, First Lady Michelle Obama, daughters Malia, left, Sasha, and Mrs. Obama's mother, Marian Robinson, walk under the landing gear of the space shuttle Atlantis. Astronaut Janet Kavandi and United Space Alliance project lead for thermal protection systems Terry White conduct the tour of Kennedy Space Center in Cape Canaveral, Fla., Friday, April 29, 2011. Only one president has been on hand to witness a space shuttle launch. President Bill Clinton, along with his wife Hillary Clinton, watched Mercury astronaut John Glenn's return to space on the STS-95 flight on Oct. 29, 1998 from the Kennedy Space Center in Florida. President Obama had planned to watch the shuttle Endeavour lift off on its final mission STS-134, on April 29, 2011, but that launch was delayed. The President and his family did visit the spaceport anyway. The Spacelab-1 (SL-1) module in orbiter Columbia's payload bay during the STS-9 shuttle mission. Spacelab, a reusable laboratory built for use on space shuttle flights, allowed scientists to perform experiments in microgravity . Starting in 1983's Challenger missions, animals became a prime component of space science. On the STS-7 mission, the social activities of ant colonies in zero gravity were examined, and during STS-8, six rats were flown in the Animal Enclosure module to study animal behavior in space. This view from a camera mounted on the external fuel tank of space shuttle Atlantis shows the spacecraft as it nears its final orbit after a successful launch from Florida on May 16, 2010. Moments later, the tank was jettisoned as planned. The space shuttle's Thermal Protection System, or heat shield, contains more than 30,000 tiles that are constructed essentially of sand. All of the tiles are thoroughly inspected before liftoff – they are a crucial tool that allows the space shuttle to endure the intense heat endured when the shuttle re-enters Earth's atmosphere to land. After the tiles are heated to peak temperature, the tiles can cool fast enough to be held in your hand only a minute later. The shuttle Columbia lifts off on the first space shuttle mission ever, STS-1, on April 12, 1981. The heaviest space shuttle orbiter, Columbia, weighed 178,000 pounds (80,700 kg), roughly the weight of 13 African Elephants. Columbia, the first space shuttle to fly, weighed the most because NASA was still searching for lighter materials to use, and integrated some of these into the later orbiters. The space shuttle program is officially known as the Space Transportation System (STS), and so each shuttle mission is designated with the prefix "STS." Initially, the missions were given sequential numbers indicating their order of launch, from STS-1 through STS-9. However, because the then-NASA administrator James Beggs suffered from triskaidekaphobia (the fear of the number 13) and wanted to avoid associations with the unlucky Apollo 13 mission, the agency drew up a new numbering system for space shuttle missions, according to NASA history accounts by several astronauts at time. What would have been STS-11 was named STS-41-B, STS-12 became STS-41-C, and STS-13 was STS-41-D. The first number was the last digit in the fiscal year (1984), the second number indicated the launch site (1 for Kennedy Space Center, and 6 for Vandenberg Air Force Base), and the letter indicated the sequence (A was the first launch of the year, and so on). After the 1986 Challenger shuttle disaster, when that orbiter and its STS-51-L mission crew were lost, the agency resumed the sequential numbering system, starting with STS-26. STS-125 Mission Specialist Mike Massimino s helped by a suit technician to don a harness over his launch and entry suit before entering space shuttle Atlantis for a simulated launch countdown. On May 11, 2009, astronaut Michael J. Massimino, a crewmember of the space shuttle Atlantis’ STS-125 mission, became the first person to use the microblogging site Twitter in space. Writing as @Astro_Mike, he tweeted "From orbit: Launch was awesome!! I am feeling great, working hard, & enjoying the magnificent views, the adventure of a lifetime has begun!" Since then, many astronauts from NASA and other space agencies have posted Twitter messages from space. One, NASA spaceflyer Doug Wheelock, won a Twitter Shorty Award earlier this year for the posts and photos he shared from space using the website during his months-long stay aboard the International Space Station. For NASA's final space shuttle mission, all four of Atlantis' crewmembers have Twitter alias. They are: commander Chris Ferguson (@Astro_Ferg), pilot Doug Hurley (@Astro_Doug), mission specialist Sandy Magnus (@Astro_Sandy) and mission specialist Rex Walheim (@Astro_Rex). Atlantis's final mission is STS-135 and will fly a 12-day mission to deliver vital supplies and spare parts to the International Space Station. NASA is retiring all three of its shuttles after 30 years to make way for a new program aimed at sending astronauts on deep space missions to an asteroid and other targets. This story was provided by Life's Little Mysteries, a sister site of SPACE.com. Visit SPACE.com for complete coverage of Atlantis's final mission STS-135 or follow us @Spacedotcom and on Facebook.